This drives me crazy. There is NO END to the afghans I want to make. And there's not ENOUGH TIME in this whole world to do them all. 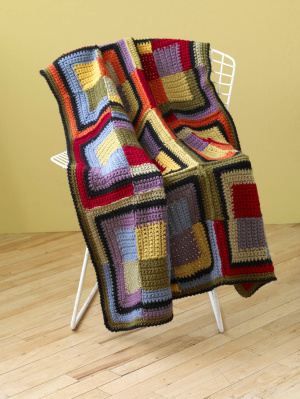 This beauty, which, by the way, would look beyond fabulous in my house, is a modern rendition of a patchworky afghan. I LOVE IT. I WANT IT! You can find the pattern here, for free and everything. You might have to register, but it's free and so worth it if you're a yarnie like LaMa and I. As LaMa would say, "Le sigh." On to work on my WIPs instead. This page contains a single entry by MamaT published on May 18, 2010 11:14 AM. smock's monday music was the previous entry in this blog. Oh, LaMa! is the next entry in this blog.